ANNIE B. JONES: spoken in the shop, vol. 20.
spoken in the shop, vol. 20. Customer: "I couldn't get into Gone Girl. I just like bestsellers." Me: "Well, Gone Girl was on the bestseller list for about two and a half years, so..."
"If I seem a little drunk, I'm not. I just have vertigo right now." Customer commenting on my reading habits: "A book a week? Do you ever just watch Jerry Springer or something?" Customer: "I just love that you guys know my name." "You haven't read Unbroken yet? Oh, you must! I didn't like the movie though. Well, really [whispers], I don't like that woman director." Former coworker to me: "I just had to come see you. It's rare to know someone who vocalizes their dream and then makes it happen... in record time! And you were so right about Gone Girl; you were an early adopter!" "It's like a little Books-A-Million. You know what? 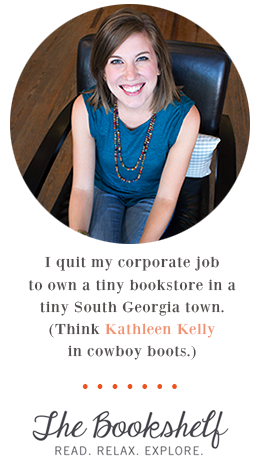 We need a Books-A-Million in Thomasville." Customer: "Oh, I thought this was a letter writing club. These are all just notecards." Manager: "We have some paper on the table as well, if you'd prefer that." Customer: "I'm used to writing 12-page letters to my friends, so that won't work either." "Do you guys have cereal here?" This is the best. I'm totally chuckling in my office cubicle.